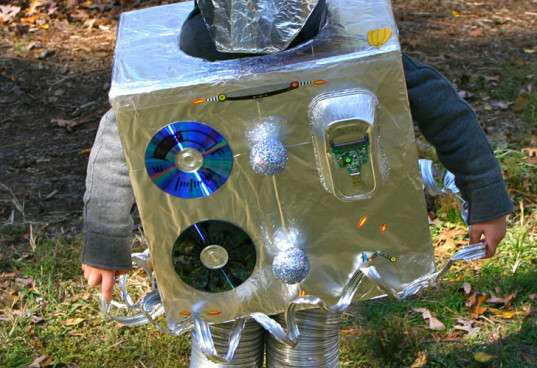 Cindy Young, crafty mom and founder of green parenting blog One Part Sunshine entered this adorable DIY robot costume in our Green Halloween Costume Contest last year. 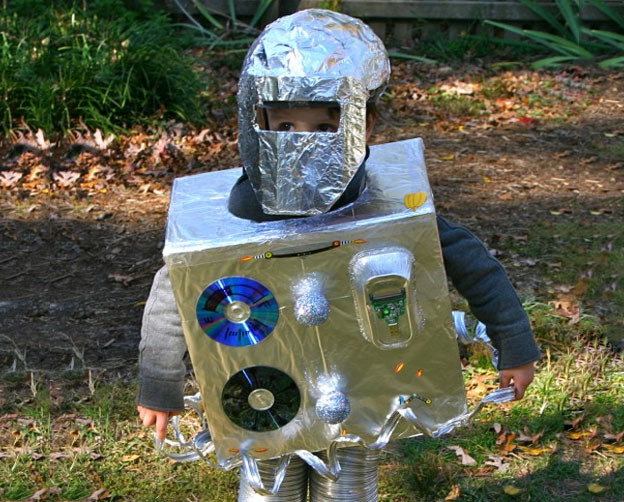 "I was so excited when my 4-year-old son announced that he wanted to be a robot for Halloween," Young told us. She thought it would be an easy DIY costume to put together and her son helped every step of the way making it even easier and more fun. Read on to find out how she did it. 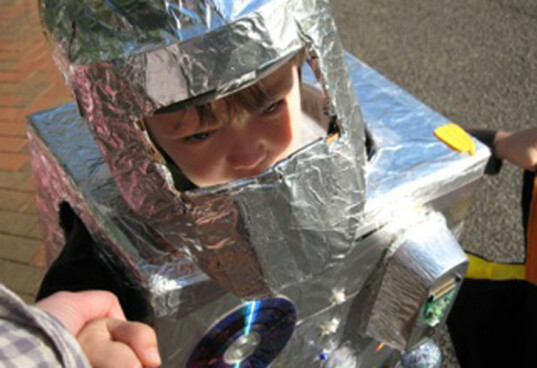 Then, enter your own DIY costume creation in our 2011 Green Halloween Costume Contest. Cindy started with a large salvaged cardboard box. She left the bottom open and cut out holes for her son’s head and arms. Cindy’s habit of saving clean aluminum foil came in handy, she used it to cover the entire box (and held it in place with glue). To dress up the box a little more, she and her son went on a hunt for shiny items around the house that they could reuse. She took two old CDs and drew gauges on them and glued them down. They also found two glitter-covered styrofoam balls that they had attempted to use for another project and glued those down as buttons. An old aluminum tray made a great control panel especially when they added the inside of a broken card reader. Some old space and rocket ship stickers dressed it up a bit more. Finally, Cindy cut five small holes in the front of the costume and taped battery-operated candles to the inside to give the costume real light features. 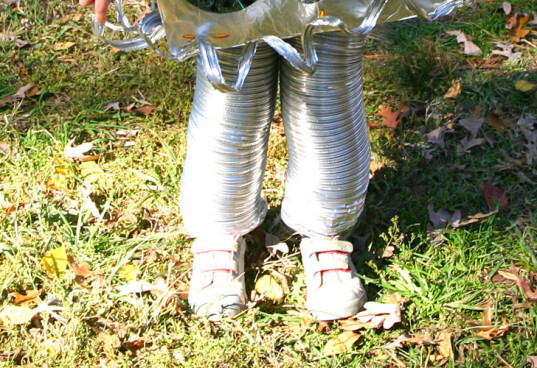 For the robot legs, Cindy used the remnants of an aluminum duct left over from a dryer installation. Her son started to pull the duct apart into what looked like a silvery ribbon so we attached that to the bottom of the box, too. For his robot head, they started with a bicycle helmet and taped a shaped piece of cardboard to it as a face mask and then covered the whole thing with aluminum foil. Underneath it all, he dressed in a nice warm gray sweatsuit. 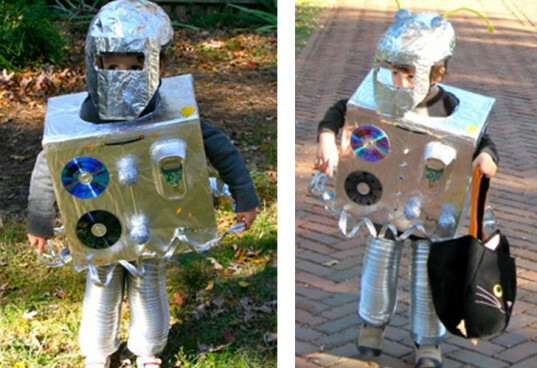 I just love the idea behind making a costume and recycling materials around the house, great job! Cindy started with a large salvaged cardboard box. She left the bottom open and cut out holes for her son's head and arms. Cindy's habit of saving clean aluminum foil came in handy, she used it to cover the entire box (and held it in place with glue). To dress up the box a little more, she and her son went on a hunt for shiny items around the house that they could reuse. She took two old CDs and drew gauges on them and glued them down. They also found two glitter-covered styrofoam balls that they had attempted to use for another project and glued those down as buttons. An old aluminum tray made a great control panel especially when they added the inside of a broken card reader. Some old space and rocket ship stickers dressed it up a bit more. Finally, Cindy cut five small holes in the front of the costume and taped battery-operated candles to the inside to give the costume real light features.